As I discussed in the previous review of Hop and Grind, I’ve been rather craving some good burgers recently, and another place that came up as a recommendation (from scooterboy at TCF) was Wild Willy’s, a New England chain with a handful of locations in Maine, New Hampshire, and Massachusetts. While the original location is in York, Maine (and, unfortunately, is now closed and for sale), their Rochester location was only about a 10 minute detour since I was already in Durham, so I decided to swing by and give them a try. Walking up to Willy’s, one thing is immediately apparent: they’re definitely grilling up a lot of burgers, since a pretty substantial plume of smoke and a rich burger smell were emanating from the building. Walking inside, there was a small line (including more than a few people that had just come from the same Robotics event!). But while you wait in line, Willy’s has got you covered. 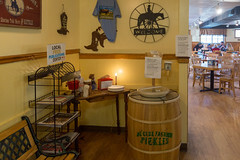 Next to the door is giant “Pickles for a cause!” barrel of half-sour pickles (in general, my favorite pickle variety), being sold for $1 each, with proceeds going to a local charity. Placing a few bucks in the jar and helping myself to a gigantic pickle (no, really, it’s huge, with many of my online friends calling it a watermelon), and in addition to the heft, it’s actually quite a good, crunchy, half-sour pickle of the exact variety I like to go with a nice pale ale or IPA. Heck, I ended up getting a second one with my meal. When it comes to the burger menu, a lot of things jumped out at me as well. 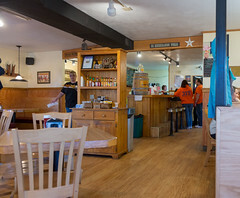 First of all, they’ve got several different meat options, with the main ones being Angus beef, natural beef from Pineland farms, and bison burgers. Next, unlike a lot of places that charge a lot extra for toppings, all of their basic burger configurations come at no extra charge, and I found myself quickly drawn to their Rio Grande burger, with roasted Hatch chiles and cheddar. For those that have read my Chuck Box review (from 2007, an eternity ago in blog time! 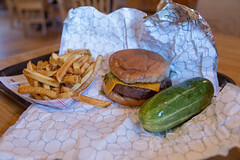 ), or have been to, say, Santa Fe Bite (or it’s predecessor, the Bobcat Bite), I’m a believer that hatch chiles on a burger are one of Western civilizations finest accomplishments, so I ordered up a Rio Grande, with natural beef, medium rare (for an extra bonus, medium rare isn’t question at Willy’s, either). Sitting down and enjoying a seat by the window in the “faux Western” interior, a few minutes later my burger and fries arrive. And I’ll have to say, it’s quite a good burger. For starts, unlike 80% of the places I go that don’t seem to understand “medium rare”, this was definitely served up a proper medium rare (well, I do like a bit more sear on it, but hey, it was pretty close), and it was very juicy and flavorful. The rest of the burger was solid as well: some nicely seared Hatch chiles (canned, not fresh, but understandable in New England), a good layer of nice yellow cheddar, and some onion, served up on a nicely toasted bun (a bit lighter heft than most, but still great), and this was one of the better burgers I’ve had in recent history, and another place I’d love to come back to soon. And the fries? These didn’t disappoint: while being single-cooked hand-cut fries, they do a good job with them, getting nice, tender fries with a good crispiness and some light salt, these complemented the burger nicely. 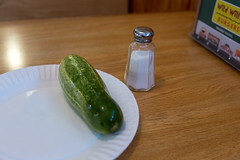 Along with my second ginormous pickle, this was a great little meal, and was also pretty reasonably priced (in this world where $15 burgers are becoming the norm, my Rio Grande was $8.70). So, while it’s enough of a drive that I unfortunately won’t be able to visit regularly, Wild Willy’s is one of the better burgers I’ve had, and I’ll happily come back and try them (or one of their other three locations) if I’m nearby. It’s definitely one of the better burgers in the region. (Closed) Like Austin to the Northeast, San Antonio has a growing food truck scene. While nothing like Austin at present, it has a few up and coming areas, like the Boardwalk on Bulverde food court, a rather substantial cluster of food trucks, for some food truck action… (located adjacent to, and run by, a company that makes food trucks, btw). The Boardwalk is a Thursday-Sunday operation, with about a dozen food trucks all located at this one spot in Northern San Antonio. It’s a rather nice little outside area, with the obligatory random selection of seating, a mechanical bulls, and a few other oddments. And, as I mentioned in my review of Erick’s Tacos, it’s only open Thursday-Sunday, so we had to make a separate trip back here to try it out. But on Friday, we finally made it to the Boardwalk, where Stop #1 was Rickshaw Stop, a well-known San Antonio Food Truck serving up delicious Pakistani kebab.